As we reflect on and study the ongoing and emerging conflicts within and between territories, we RECOGNISE the urgent need to reach out to the unreachable in our journey towards inclusive peace. We JOIN the peoples of Myanmar as they journey through a transition where it is vital that peace, security and development encompass a just and equitable relationship between the various ethnic groups and faith communities of the country. We CALL for strengthening diverse national and local voices in the decision making processes of the current negotiation towards a genuinely people-centered peace process. We ACKNOWLEDGE the challenge to be INNOVATIVE in our approaches in dealing with the emerging challenges of modern technologies, liberal market systems, disaster and climate change, strong identities based on several aspects, majority and minority relationships, especially in complex political transitions. We URGE and CALL on nations and stakeholders to commit to address problems through dialogue and non-violent means. We ENCOURAGE civil societies to be nurturing accompaniers towards peaceful and resilient communities and relentlessly work towards sustainable peace in their own context and across contextual boundaries. We COMMIT ourselves as peacebuilders to continuing action for conflict transformation in our communities and countries, and in our region. We OFFER ourselves as resources to nurture one another as peacebuilders. 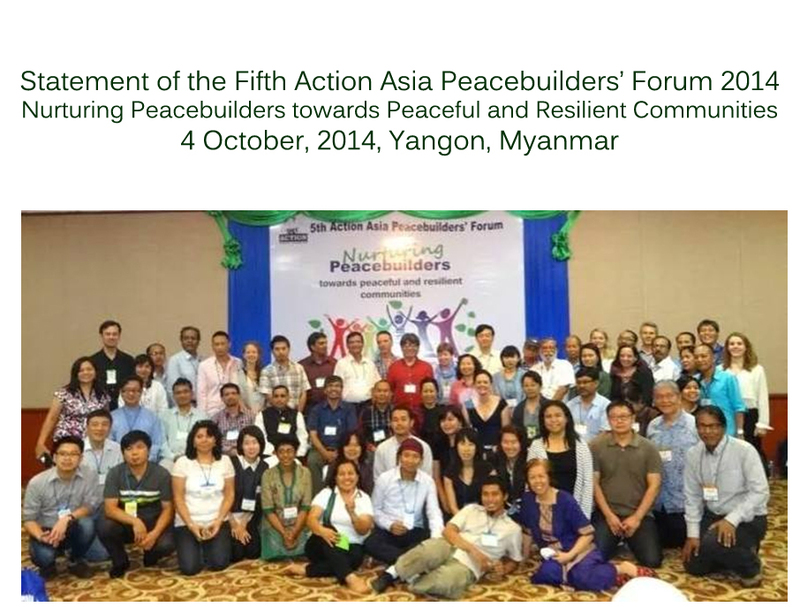 We express our heartfelt gratitude to the Secretariat, and host organizations – the Gender and Development Initiative-Myanmar and Shalom Foundation, and the partners who have made this Forum a meaningful and enriching experience for us as peacebuilders.